Naresh Agarwal, a Rajya Sabha MP from the Samajwadi Party recently raised the issue of poor attendance of nominated celebrity MPs Sachin Tendulkar & Rekha. 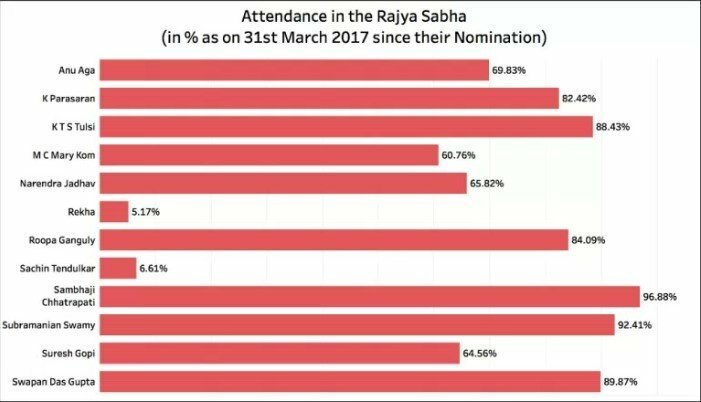 Latest data from the Rajya Sabha website suggests that Sachin with an attendance percentage of 6.6% has attended the Rajya Sabha 5 days more than Rekha did. The Rajya Sabha or the Upper House has 12 nominated members. 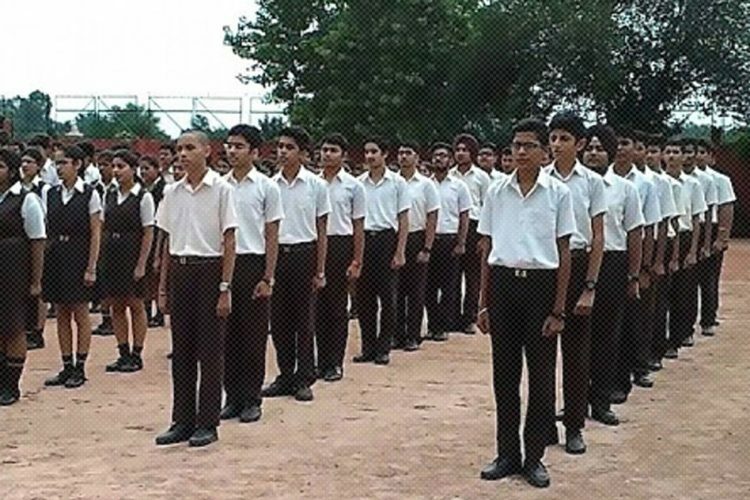 These members are nominated by the President as per the advice of the government of the day. Article 80(3) of the Constitution of India authorizes the President of India to nominate a maximum of 12 members to the Rajya Sabha and the members nominated shall have special knowledge or practical experience in the fields of Literature, Science, Art & Social Service. Currently, there are 12 nominated members. Four of them were nominated in 2012, one in 2014 and the rest seven in 2016. Four of the nominated members joined the BJP and are counted as BJP’s members in the house. A nominated member can join a political party within the first six months of being nominated to the house as per the rules. Among those nominated in 2012 were Cricketing great Sachin Tendulkar and yesteryear actress Rekha. 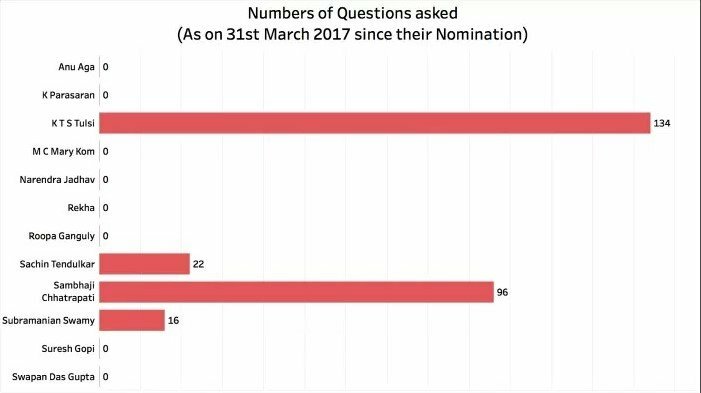 So how are these nominated members performing in the house in terms of attendance, participation in debates, questions asked and MPLADS spending? 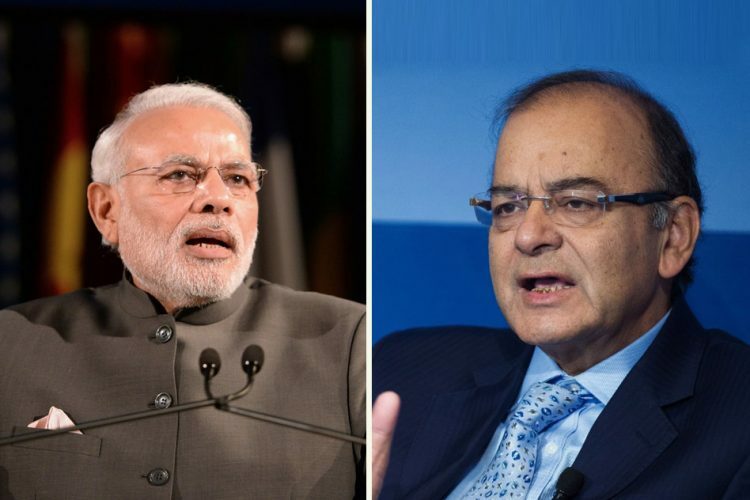 How much expenditure is being incurred on them in the form of salary & allowances. Samajwadi party MP Naresh Agarwal raised the issue of Sachin & Rekha’s attendance in the Rajya Sabha while lamenting that they hardly attend the house. 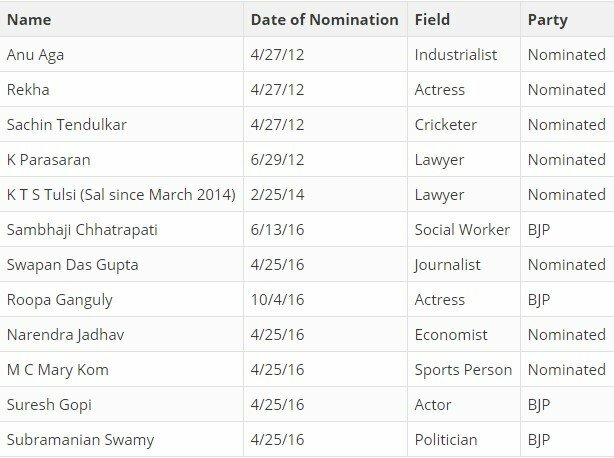 As on 31st March 2017, Sachin & Rekha are the worst performers in attendance of all the nominated members. While Sachin attended only 23 of the 348 days since his nomination, Rekha attended only 18 of the 348 days. In fact, Rekha has the distinction of not attending more than a single day in any session since her nomination. As on date, Rekha hasn’t asked a single question in the house in her close to 5 years in the Rajya Sabha. Sachin fared better by asking 22 questions. 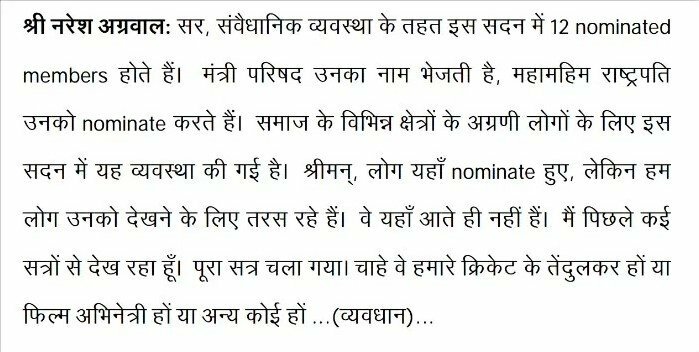 Anu Aga who was nominated along with Sachin & Rekha also did not ask a single question till date. K T S Tulsi asked the most questions of all the nominated members. It has to be noted that 7 of the 12 members were nominated only in 2016. Sachin & Rekha haven’t done any better even on the debates front. 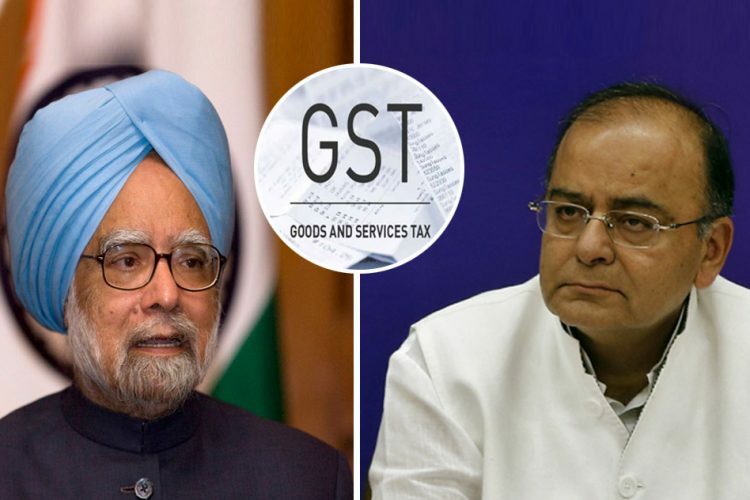 Both of them haven’t participated in a single debate in their close to 5-year stint in the Rajya Sabha. 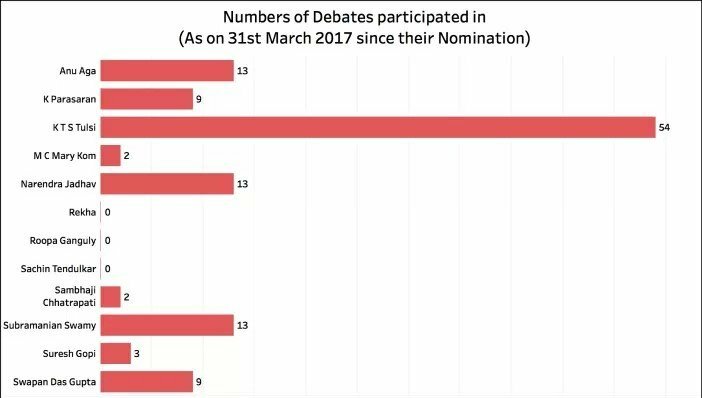 On the other hand, actor Suresh Gopi who was nominated in 2016 participated in 3 debates and boxer M C Mary Kom participated in 2 debates already though she was nominated in 2016. Under the Member of Parliament Local Area Development Scheme (MPLADS), each MP has the choice to suggest to the District Collector of the nodal district chosen by them, works to the tune of Rs 5 Crores per annum. 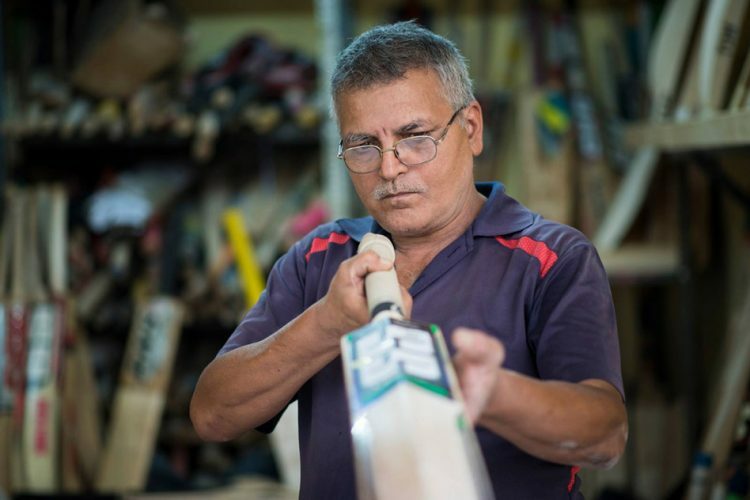 The Nominated Members of the Rajya Sabha may select any district from any State in the Country for implementation of their choice of work under the scheme. Under MPLADS, the role of the MP is limited to recommendation of works. Thereafter, it is the responsibility of the District Authority to sanction, execute and complete the works recommended by the MP within the stipulated time period. The Rs 5 crore per annum is not automatically released each year. The first instalment of Rs 2.5 crore is released without any condition. But the subsequent instalments are released subject to certain conditions like the utilization of the previous instalment etc. Hence, the amount entitled is not always equal to the amount available to spend. Since the MP only has a recommendatory role, we look at only the amount entitled, amount available to spend and the amount recommended for works. It has to be noted that a greater amount is released by the government provided a greater number of works are recommended by the MP and are executed by the district authority. Sachin seems to have done much better than Rekha on the MPLADS spending. Of his entitlement of Rs 25 crore till date, Rs 17.65 crore is available to spend while he has recommended works worth Rs 21.19 crore. Rekha on the other hand has recommended works to the tune of Rs 9.28 crore while the available amount is only Rs 7.6 crore. Sachin has done better than all the other MPs who were nominated along with him in 2012 on the MPLADS spending. 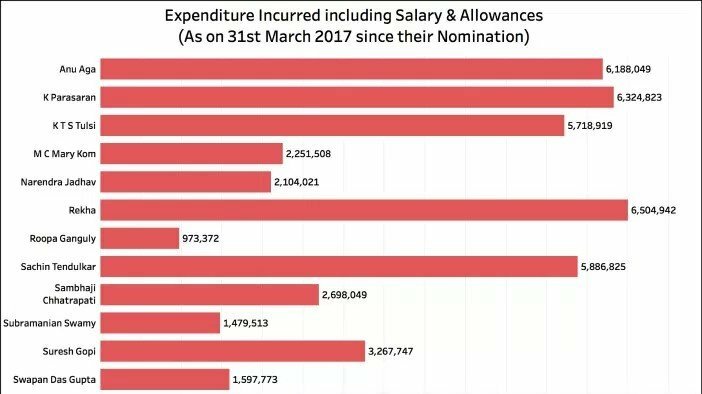 It is surprising to note that though Rekha attended the least number of days compared to those who were nominated along with her, the expenditure incurred on her is the highest till date. 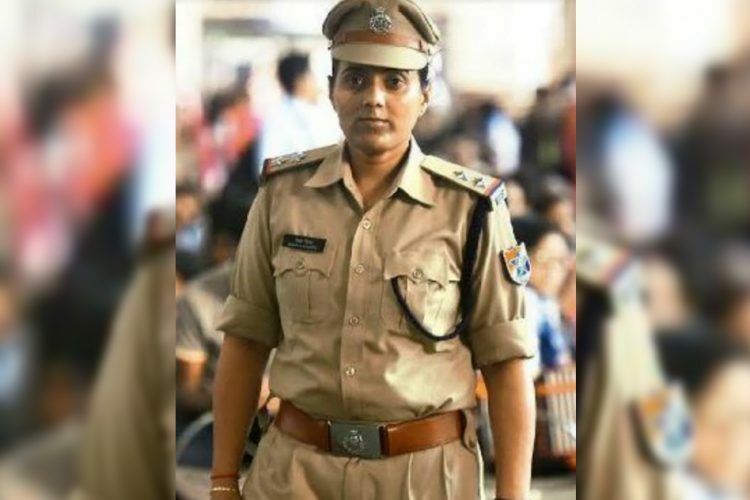 A total of Rs 65 lakh is incurred on her salary and expenses. Expenditure incurred on Sachin is Rs 58.8 lakh while on Anu Aga is Rs 61.8 lakh. 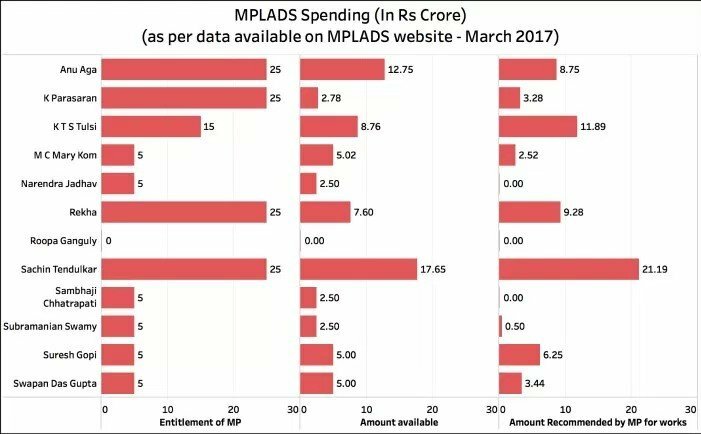 The difference in the expenditure is only because of the TA/DA since all other components are fixed for every MP. If a particular MP attended the house more often than others and has traveled extensively than others, the expenditure incurred on him/her would be high. But in Rekha’s case, it is the opposite. If the expenditure per day of attendance is considered, expenditure incurred on Rekha is Rs 3.6 lakh per day and on Sachin is Rs 2.56 lakh per day.